Today, modern brides can marry in virtually any style or vintage. This means bridal veils can vary greatly both in style and fabric, so the fabrics used on the headpiece or edge finish should match the colour or style of the gown. If the gown is being tailored for you, there will be leftover fabric to add to part of the veil or headpiece. Modern veils are almost transparent and cover the bride with a cloudy aura. The bride's face is obscured rather than concealed. The length should be just above or below any focal point of the dress. 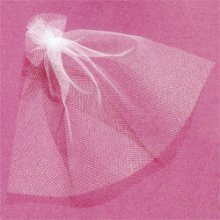 Bridal veils can be made from silk or nylon, be plain or have edges of lace, crystals, pearls or ribbons. In some cultures a white veil symbolises modesty and virginity. The most common shades are white and ivory. This veil is the most popular style. It consists of layers of veiling reaching the finger tips. 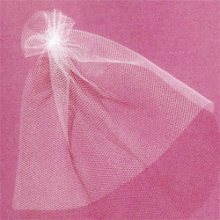 This veil reaches down to the ankles and may be plain or lined with satin or organza..
A shoulder-length veil, worn to obscure the face until after the ceremony when it is pulled back. It is often combined with other lengths and used for formal and semi-formal weddings. This is a multi-layered veil with just reaches the shoulders. A less formal look. The mantilla veil is usually draped over a decorative comb and secured with hair pins. Usually worn without a headpiece, the mantilla is traditionally made of lace or edged with lace. It is worn over the head like scarf. Wedding attire followed current fashions until the mid-1900s, with veils coming and going. 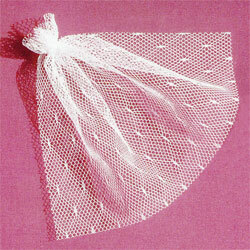 This is a very fine, soft form of nylon veil that hangs nicely. 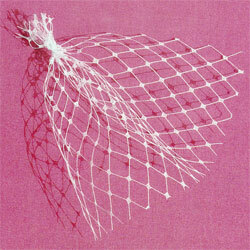 It is the most common of veil materials. It comes in a variety of widths and lengths. It can be sparkly or flat and comes in a variety of whites to match your dress. It is perfect for traditional veiling for brides. Is slightly heavier and also comes in a variety of colours. Is a quite courser mesh with a dotted design. Fairy Godmother tip; examine your veil under natural light to make sure that it's the same shade as your gown. Veils may be long or short, falling anywhere from the shoulder to the floor. The veil is anchored to either plain, jewelled headpieces or bridal tiaras. It is designed to sit on the crown of the head or further back, depending on your hairdo. Prices of veils can vary depending on how much fabric is used and whether or not it has beading and intricate detailing. If you choose to make-it-yourself, Fairy Godmother tip; buy a plain veil and embellish it with your favourite crystals and pearls. Your can buy beads from jewellery bead shops. Sewing them to your veil is a whole day experience, so get your bridal party together, some nibbles and tea and make it a fun memorable day. You'll save money and have a great day!